Introduce your new baby to friends & family with a totally unique card created to order and then dispatched within 5 working days (after artwork approval). 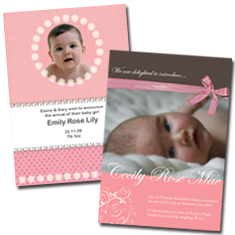 Fully Personalised: Designs can be adapted as Birth Announcements, Christening Invitations or even 1st Birthday Invitations. 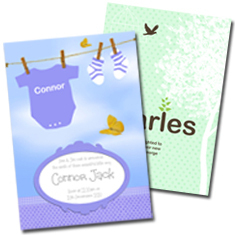 Whether you're looking for a simple birth announcement or a totally unique Christening Invitation, I have a gorgeous range of affordable designs I'm sure you'll love. 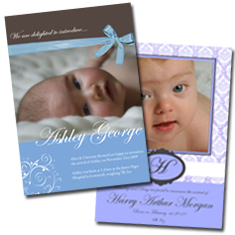 Contemporary and classic designs, professionally printed and featuring your own message and optional photo. Simply tell me the wording you'd like and I will create a wonderful unique announcement card just for you. How it works: The designs show suggested wording, but feel free to alter and adapt it to your own requirements. You can also change it completely so that the design can be used for a Christening Invitation or even a lovely 1st Birthday invitation! Simply choose your favourite design and quantity needed, and click the "Buy Now" button. After making your purchase you will receive an automatic email from me acknowledging you order. Please reply to this email telling me the wording you would like on your cards. If you need to send me a photo for your design, the instructions on how to do this will be in the email you receive. (Your photo doesn't need to be a professional photo, just a favourite snap that you love, but it does need to be a minimum size. Click here for advice on the best type of photo to send.) I will email a proof of your announcement for you to check within 3-5 working days. 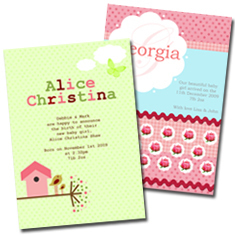 As soon as I receive approval from you, your cards will be printed and dispatched within 5-7 working days. Click on the images below to browse the designs available.